The following is a personal letter written by my great-grandfather Charles A. Bliley at the age of 74. It is addressed to his granddaughter, Gertrude May Bonnell, age 20. The letter relates the reasons for the Bleile family's emigration in 1834 and the path of their travels ever Westward. Charles was 12 years old at the time of the trip. He later served in the merchant marine on the Great Lakes of North America during his teenage years. Andrey Bleile and Catherine Eich where Charles' parents. For further information about this letter, see "About This Letter" below. The following version is a faithful transcription made in 2004 by myself, Charles A. Bliley. The spelling, grammar and punctuation reflect the letter's content, exactly as written. While it may be difficult at times to understand it is a honest transcription. Images of the actual letter are available for viewing online. Dear Gerty at is with pleasure that I wil try to answer your inquiries of your German ancestry, to the best of my ability. My mind often runs back, of the past 73 years of my life, to the Country of my birth and the early escistence of my Childhood. Many & many a time have I raised my thants up to Heaven, and thanked God, that he gave my Father and Mother courage, to undertake such a perilous, and long journey, under such nnveiverable circumstansis, for the good of their children, of which, thank God we have received such abundend benifit. By lookin at the Map, you will find the Country that your Gr Grand Parence lived in, was I think called, the grand Dutchis of Baden in Germany, their home was in a Village by the nam of Krotsingen, that contained perhaps 8 or 9 hundred inhabitens, (the People in that country all live in Vilages) and those that ar not ocupied with som traid, make their living by tilling the soil, by this later ocupation, your Gr Grantparence made their humble but comvertable living. It was in the year of 1833 that he disited what to do, there were others in the Village that fell in with his opinion, and thre Families made up their minds to go with him, likewise two other Families in ajoining Vilages would go with the company, in the fall of 1833 they used to meet at our House to talk the matter over, my Father being rather the leader of the company, and well do I remember, when they all came to the conclution, of seling out, and starting for the new country the next April, I went in our Childrens bed room, and cride as so my heart would brake. till Mother came up and pacyfied me, and dried up my tears, in my childish vews, I had a strong atatchment, for my humble home, was contented and could see nothing beter in the feuture. Well do I remember the Teacher that taut me the a.b.c. and likewise The old Rev. Father Stum, an old gray heated Priest, for whoom and his assistent, I had served as Altar boy for som two or three years, and who paid me nine Kreitser every Sunday morning in new coin, aparently rite from the G mint. I remember the old Church, centurys old where your forefathers met to worship and adore the true and living God. All this frequently comes to my mind, and causis a pleasent and I migt say a holy feeling in me to metitate on, but enough of this for it may not be of any interest to you. In the Winter of 33 & 34 my Father sold out with the rest of the company, and were getting redy to start by the first of April, when my Father was takin sick with a strok of palsy, (now called Parelised) his left Side was comparitively dead, which of cours, put a stop to emigration, when the rest of the company saw the condition of my Father they had no other joice then to proseed on their journey, and left Father behind. In som thre month time with good metical etention and the best care, he was able to leave his bed and hoble around on his crutches. Feble and lame as he was he still persisted in going, his relations and Friends all tried to persuad him from undertakin such a long journey, my Mother, (God bles her) talked to him with tears in her Eys, but all to no purpes, he would go, and did go, Mother saw the great undertaken of the journy better then Father, with an invelet husben, five small Children, an aget Aunt of Fathers, making a Family of eight, the care of which she saw wold mostly fall on her, and it did. we got along as best we could, Father not being able to do any manual labor, the neigbors what few we had, were very kind to us, and helpt us to get wood, and don us many a kind act. After seteling here in November. the following Febuary he had another shock of Palsy on the right side and two after Died, I think in his forty ninth year of age. from your Grand Father Chas Bliley"
The following version is as transcribed in the 20th Century by Henry H. McConnell (1874-1959), Gertrude's husband. The spelling, grammar and punctuation were altered to make it reflect more modern language and to address what were believed to be mistakes. See About This Letter, below, for more information. It is with pleasure that I will try to answer your inquiries of your German ancestry to the best of my ability. My mind often runs back, of the past 73 years of my life. to the Country of my birth and the early existence of my childhood. Many and many a time have I raised up my thanks up to Heaven, and thanked God, that he gave my Father and Mother courage to undertake such a perilous and long journey under such unenviable circumstances for the good of their children, of which, thank God, we have received such abundant benefit. By looking at the map you will find the Country that your Great-grandparents lived in was I think called the Grand Duchy of Baden in Germany. Their home was in a village by the name of Krotzingen (Krozingen) that contained perhaps 8 or 9 hundred inhabitants (the people in that country all live in villages) and those that are not occupied with some trade make their living by tilling the soil. By this latter occupation your Great Grandparents made their humble but comfortable living. Krotzingen is located some 9 miles from a beautiful city called Freiburg, of which I still have a good recollection, having been there a number of times with my father. I distinctly remember the beautiful Cathedral, the large public buildings, the paved and neatly kept streets, the beautiful parks, etc. and an old castle of ancient times, which was then in ruins by the visitation of wars in olden times. This castle is located a mile or two outside of the city on a large hill. Your great grandfather's name was Andrey Bleile and your great grandmother's name was Catherine (Eich) Bleile. My mother was born Nov. the 25th 1794. My father's birthday has been lost by the burning of our house. I think he was some 3 or 4 years the oldest. They had five children, three girls and two boys. My father was a man of good education, likewise was my mother. Father was well posted on political matters of his country, and read and heard a good deal of the new world of North America, of its free institution as a republic and of its great inducements for the laboring class of people. On the other hand he could see nothing but oppression by the crown rulers. He could see that a laboring man could not improve nor better his condition in that country; to be born poor was to die poor. So after long and due consideration, having talked the matter over with mother, and with her consent, he finally made up his mind to make the change and take his family to America, the land of the free and the home of the brave. It was in the year of 1833 that he decided what to do. There were others in the village that fell in with his opinion, and the families made up their minds to go with him; likewise two other families in adjoining villages would go with the company. In the fall of 1833 they used to meet at our house to talk the matter over, my father being rather the leader of the company, and well do I remember when they all came to the conclusion of setting out and starting for the new country the next April, I went in our children's bedroom and cried as tho my heart would break till mother came up and pacified me and dried up my tears. In my childish views I had a strong attachment for my humble home, was contented and could see nothing better in the future. Well do I remember the teacher that taught me the a,b,c and likewise the old Rev. Father Stum, an old gray headed priest, for whom and his assistant I had served as altar boy for some two or three years and who paid me nine Kreitzer every Sunday morning in new coin, apparently right from the mint. I remember the old Church, centuries old, where your forefathers met to worship and adore the true and living God. All this frequently comes to my mind and causes a pleasant and I might say a holy feeling in me to meditate on, but enough of this for it may not be of any interest to you. In the winter of 33 and 34 my father sold out with the rest of the company and were getting ready to start by the first of April, when my father was taken sick with a stroke of palsy (now called paralyzed). His left side was comparatively dead, which of course, put a stop to emigration. When the rest of the company saw the condition of my father they had no other course than to proceed on their journey and left father behind. In some three months time with good medical attention and the best care he was able to leave his bed and hobble around on his crutches. Feeble and lame as he was he still persisted in going. His relations and friends all tried to persuade him from undertaking such a long journey. My mother (God bless her) talked to him with tears in her eyes, but all to no purpose, he would go and did go. Mother saw the great undertaking of the journey better than father, with an invalid husband, five small children, an aged aunt of father's, making a family of eight, the care of which she saw would mostly fall on her, and it did. There were no railroads at that time. We put our good on a wagon, to the River Rhine, crossed over, then had a team engaged to take us across the continent of France to the sea coast at Haverdegras. We went through several large cities, likewise through the city of Paris, where we stayed for twenty-four hours and took a walk through it. On arriving at the seaport of Haverdegras, we remained there a week, then went on board a ship calledwith some 115 steerage passengers, and there were likewise some twenty cabin passengers on board. We had some heavy storms, all got sick, and I have often heard mother say that I was the only one not sick and had to wait on the rest of the family. There were several times during the storm that the passengers would be scared, hang on to something they could cling to, get on their knees and say their prayers, thinking the ship would go to the bottom, when according to my subsequent experiences as a sailor I made up my mind there never was any danger or cause for alarm. We were thirty-eight days on the ocean and finally arrived at New York. We stayed in New York three days and finally took a steamboat for Albany, intending to go to the state of Ohio. At Albany we came on a canal boat to Buffalo where we took a steamboat intending to go to Cleveland, but arriving in Erie part of the company that left us in Germany were there and they prevailed on father to remain in Erie. 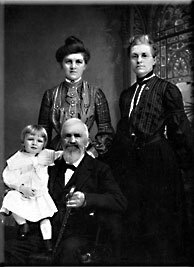 We stayed in Erie some three weeks when father bought forty acres of land in the wilds of the southwestern part of Harborcreek Township, eight miles from the then town of Erie. There was about eight acres of newly cleared land on the place with a new and comfortable log cabin which consisted of all the improvements. Father engaged an oxteam and in the month of November 1834 started with his family for our new home. The weather was cold, the mud and snow was deep, the roads were full of stumps and trees, that it took us nearly two days to come to our place of destination. When we finally arrived there and mother took in the situation surrounding her, with a sickly husband, five small children, among strangers, could not speak a word of English and I presume nearly out of money, she gave vent to her feelings and cried as tho her heart would break. We got along as best we could, father not being able to do any manual labor. The neighbors what few we had were very kind to us and helped us to get wood and did us many a kind act. After settling here in November the following February (1835) he had another stroke of palsy on the right side and two [word missing in letter] after died I think in his forty-ninth year of age. In order to be in time for the mail I must bring this to a close, altho I could have a good deal more to write about myself and family. Your grandfather Charles was born in Krotzingen, Baden the 23rd of July 1822. The letter was passed from Gertrude to her son, Elliott McConnell Bonnell, and then to his son, Elliott McConnell Bonnell, Junior. The photographic scans of the original letter were generously provided in January, 2004 by Elliott Bonnell, Jr., to me, Charles A. Bliley, another great-great grandson of the author. This letter was written to Charles A. Bliley, aged 73, to his 20-year-old granddaughter Gertrude May Bonnell just nine months before his death. (Gertrude later married Elliott M. Bonnell.) It was written on both sides of five sheets of paper with light blue rules and an embossed stamping in the upper right-hand corner that appears to be of the U.S. capitol building. Charles never returned to Germany and was the age of 12 at the time of the family's emigration to America 71 years earlier. He had practically no schooling by any account, and none after coming to America. His lack of formal education did not deter him from spending time as a young man in the merchant marine service on the Great Lakes and later becoming a very successful farmer in his adopted community of Harborcreek Township, Erie County, Pennsylvania. In spite of the lengthy period since the trip, it is evident that his mind was still working very well. His simple words describe very well, the personal struggle my ancestors undertook to come to America; a story that is typical of many emigrants of the Nineteenth Century. As common as the story line may be, the words have moved me to tears on more than one occasion. It is a story of a man with a dream to improve the conditions under which his family lived and provide them with greater opportunities. He achieved that goal by risking his life and in the end died a year after arriving in America. The greatest surprise is the appreciation his son, Charles, felt for what some would have considered an act of pure foolishness at the time of their emigration. In 2004, I was blessed by the gift of photographic scans of the original from a distant cousin, Elliott McConnell, Gerty's grandson. I connected with him in 1999 through an genealogy Web site focused on genealogy interests in Erie, Pennsylvania. What a blessing that accidental meeting has been to me. 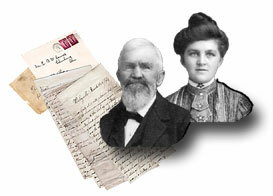 The letter was first transcribed by Elliott Bonnell, Senior (1846-1917). Over the years, his and two other transcriptions of this letter were generated; all have some small variations in punctuation, spelling and breaks for paragraphs. The 2004 transcription, as fund here, is a faithful transcription based on the photographic images of the hand-written letter. I deliberately chose not to change misspellings or grammar; the story is sufficiently clear and too powerful to be influenced by such subtleties seemingly demanded by modern language. One point of note: there is no mention of Charles' uncle, Sebastian, and aunt, Magdalena, who were also passengers on the same ship, the Charlemagne, which carried Andreas and his family in September of 1834. Charles Bliley's father was Andrey Bleile. All of his children went by "Bliley", the Anglicized version of the family name. One unexplainable exception was Andrew William, Junior who used "Blila". If you care to view the original letter, you will find them on my Web site, www.Bliley.net. 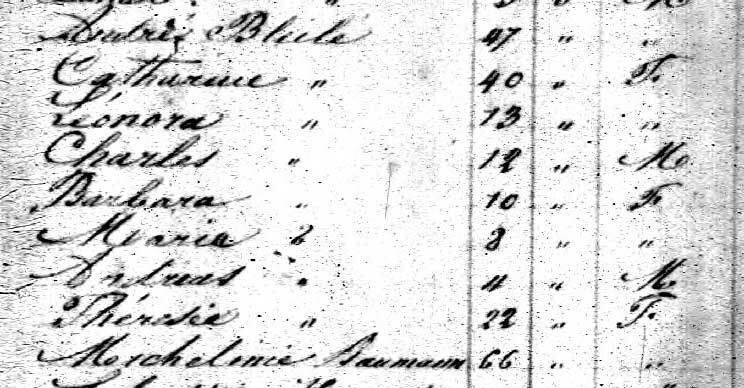 Look in the family history section for The Chronicle the Bleile/Bliley Family Emigration to America in 1834. I never expected to have the answers to my many questions about our family history, but a surprising number of them have come through the generosity of distant family members and strangers. This letter is one of them. Scans of the letter are available for online viewing in two levels of quality: high resolution suitable for high-speed connections, and low-resolution, suitable for low-speed connections or a quick viewing. Seated: Elliott Bonnell McConnell, Charles A. Bliley. Three files are available for downloading and off-line viewing of the letter and background information. Please note, these are large files. A CD-ROM is available containing the contents of this site and archive versions of the ordinal scans. Please contact Charles A. Bliley for details and conditions of use.